When can I start applying REVIVE? Apply Revive anytime the grass is green and growing. First applications can begin when the turf is at least 50% out of winter dormancy. How long does REVIVE last? It should last about six weeks under most conditions. Which is better, liquid or granules? For most homeowners, it comes down to ease of use. Revive liquid is perfect for spot treating smaller areas or spots along walks and driveways. If you have a broadcast spreader, the granular treats more square footage quicker than the liquid. 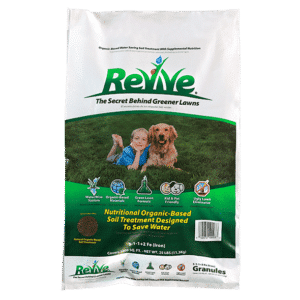 There is an added benefit from the granular formulation called DPW (Dehydrated Poultry Waste), which gives you a nice slow release of non-burning organic fertilizer not found in the liquid Revive. What are the spreader and hose end sprayer settings for the Revive granules? 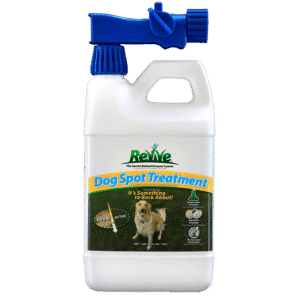 Hose End Sprayers: fill the sprayer with undiluted Revive concentrate. Turn the dial to 8 oz. setting. Spreader Settings: Revive Granules can be applied with any broadcast or drop spreader. Settings are approximate due to walking speed and overlap. Set dial to 1/3 open and adjust up or down for adequate coverage (i.e., A spreader with a 15 as the highest setting should be set to a 5). Where can I find REVIVE? There are hundreds of dealers in many states. To find a store nearest you click here for a complete listing. Is REVIVE safe for childern and pets? 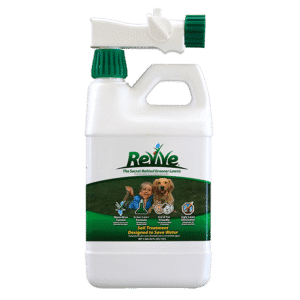 Since Revive is organic-based, it is safe for use around people and pets. If your pet tends to eat just about anything, we suggest storing the product in a safe place. How does REVIVE break up compacted soils? 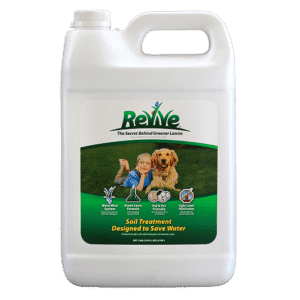 The wetting agents in Revive allow the water to penetrate hard compacted soils. Once the soil is wet, it will loosen and allow for better water and air movement. Roots don’t grow in dry soil. Once you wet the soil deeper, roots will follow that moisture helping to break up the soil as they grow. The organic matter in Revive will help feed the microbial activity in the soil, which also breaks up the compaction. Does REVIVE work on sandy soils? Yes, even sandy soils can produce isolated compacted areas causing drought stress conditions. Revive’s wetting agents allow water to penetrate these areas getting your turf back to the green color you desire. Revive’s organic matter also aids in the water holding capacity of your soil. We recommend Revive Granules on sandy sites as the extra organic matter in our bags is exactly what your turf needs. Does REVIVE work on all grass types? Revive has been tested on every grass type, both cool and warm season, and has shown positive effects in color, thickness, and drought hardiness. Can REVIVE burn the lawn if I over-apply? Revive has been tested in 100 + degree heat at very high rates and still shows no burns with both liquid and granular. Do I apply REVIVE before or after mowing? What time of day? Any ideal temperature for application? We recommend applying Revive after mowing. Time of day or temperature will make no difference in the results. Water for about 10-15 minutes after the application. Is REVIVE safe to use after new seed or sod? Revive is ideal for any new seeding or sodding projects. Revive was tested and the results were fantastic. How often should I use REVIVE? A good rule of thumb is every time you fertilize, but that can vary from homeowner to homeowner. Because the wetting agents will begin to lose their effectiveness after about six weeks, we suggest a treatment once every six weeks. If you have severe drought conditions, severe slopes or persistent dry, compacted spots, you can spot treat every 3-4 weeks.